E-readers have been around for a number of years, but really didn’t take off until the first Kindle was introduced back in 2007. There have been a number of advances in the past few years, including cleaner text, faster page turns, WiFi, and touch screens. E-readers have also become thinner, lighter, and just look more polished overall. Of course the biggest improvement has been the drop in price. With each model, the price dropped as the technology improved. In the last four years, the price has dropped from nearly $400 for the original Kindle, to around $79 for the most basic model (with ads). The ebook market that was once fledgling now outsells hardback and paperback books on Amazon.com. I was originally a purist, never thinking I would like to read on an electronic screen. I wanted to physically turn pages and feel the heft of the book in my hands. Then I received the Kindle 1 as a (very generous) Christmas present. And I love it. I won’t say I never looked back, as what I read now is pretty evenly split between paperback and ebook, but the two experiences are more interchangeable than I ever imagined. The beauty of the e-reader is in the screen. 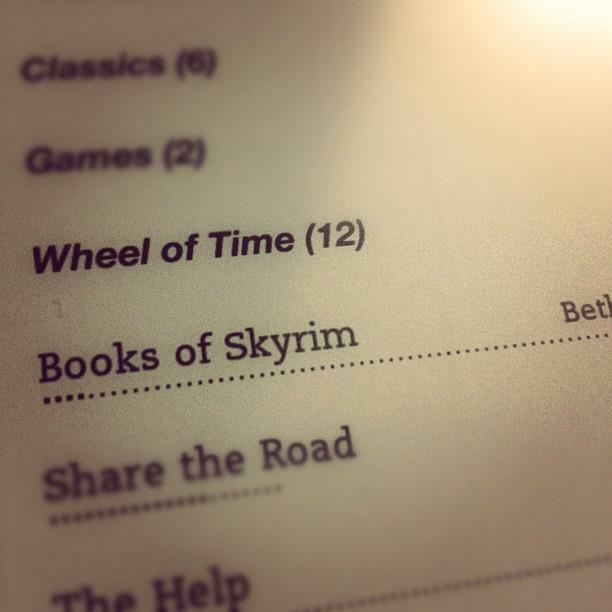 The combination of E-Ink and a non-glare screen make for a great reading experience. There isn’t the glare of the typical computer screen so you can read it in bright daylight, and since the screen is not back-lit, there is none of the accompanying eyestrain. However, since the screen is not lit up, it can be difficult to read in low light. Of course, in this respect it isn’t much different from a paper book, but it is still a complaint for some. I have been known to don a headlamp to read late at night, though not as often now that I started wearing glasses. 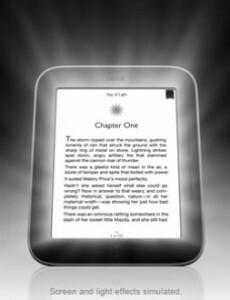 But wait…coming soon from Barnes and Noble, the new Nook Simple Touch sporting a new feature they are calling “GlowLight”. The new Nook still has an anti-glare, E-Ink screen, but you can dial up a soft glow behind the screen to help you read in low light. Or as their site puts it, “End bedtime reading debate-when you want to read & your partner wants to sleep”. It won’t be released until May 1st, so there are no hands-on reviews yet. I will be curious to see if the back lighting is strong enough to make a difference, without creating eye strain or otherwise getting in the way of the reading experience. If this works, it could be a real selling point for the Nook reader. I tried out a Nook a number of times when I was trying to see how the formatting of my novel came through (there were several hiccups along the way, so I was back several times). The Nook seems to be a good device, but it has consistently trailed the Kindle since its introduction. I will definitely stop in to Barnes and Noble to check it out when it is released, but I don’t think it will be enough to tempt me to replace my old Kindle. While all the bells and whistles are kind of cool, the stated intention of the Kindle when it came out was to have the technology fade into the background and let you fall into the world of the book. In that and other respects, it still works just fine. The headlamp is always there just in case. I have been notified by Amazon, Facebook and a number of news outlets that the new, non-Harry-Potter book from JK Rowling is due out September 27th. There is an understandable level of curiosity about how she will follow up after such a successful series. She is not only leaving the Harry Potter universe behind, but the new book is also not in the very hot Young Adult genre. Some are calling it a sophomore effort, which seems odd after writing seven successful novels, but there is no question there will be heightened scrutiny to go along with the hype. I am curious just like everyone else, and followed the links to see what the story is about. But before I could get to the book jacket description, something at the head of the page put my guard up. The publisher will undoubtedly capitalize on the built-in, anxious market and sell millions of books, but they have chosen to do a little gouging in the process. The suggested hardcover price is $35. Though few will pay this (as Amazon.com is already discounting it to $21), $35 for a piece of hardcover fiction seems out of touch. I felt the same way when I saw the $36 price tag of the Ken Follett book Fall of Giants. I am a big fan of his writing, and know that he does extensive research beyond the writing to make his books historically accurate, but the $36 price tag priced me out of his market. I was excited to read it, and wanted to have a copy to keep, but decided to wait in line at the library instead. If it had been priced more typically, I am sure I would have bought it, but the price forced me to wait and I ended up reading it for free (thank you again, robust library system). All this said, I rarely buy hardbacks anymore. There is no money in the budget to be an early adopter anymore. I almost always wait for the paperback, ebook, or eventual library availability. So though $35 sticks in my craw, it is sort of irrelevant. What really grabbed me on the JK Rowling book was the ebook price. Even though the production costs are lower, the shipping costs are essentially non-existent, and there are no returns of unsold books from bookstores to account for, the ebook price is higher than the paperback. There is debate about the sweet spot of ebook pricing among self-published authors. Authors obviously make more money on a higher priced book, and it is tempting to cozy up close to soft ceiling of $9.99. At 99 cents, you make very little on each copy, but the volume may make up for it. Where the lines cross is a matter of anecdote and experimentation. I priced my ebook at $2.99. This seemed like a fair price for a novel-length work. The paperback is priced at $7.99, so the ebook feels like a real bargain. And because of production costs, I actually make a little more on each ebook sale. There is value in a piece of writing. Writers should be paid for their hours, days and years of effort. Publishers, distributors and bookstores need to make money as well to keep the doors open. I am absolutely willing to pay read a good book, even when money is tight. But when publishers set prices unreasonably high, they shrink their market. Rather than getting $10 or even $25 dollars from me, they get no incremental money when I check the book out from the library instead. I am sure JK Rowling’s publisher will sell untold copies of her new novel regardless of the price. The pre-sale is already high up on the Amazon charts. They can get away with the price gouging on these hot authors with their built-in markets, but the system is changing and publishers are no longer the gatekeepers they once were. If they continue to price ebooks high to try to keep people buying the paper versions, they will likely go the way of record companies clinging to CD sales while the market moved on to MP3s and iTunes. And just to be clear, this is not what I am rooting for. 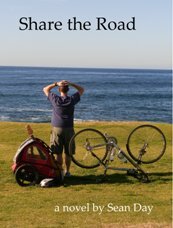 Share the Road is available in three different versions – Paperback, Kindle and Nook. This is how my January sales were split between the three. The order does not surprise me. Even though it is priced higher, I figured that the paperback would sell more quickly in the first month. I was pretty sure the Kindle would outsell the Nook, but the number of Kindle sales were higher than expected. They were not that far behind the paperbacks, and they clearly trounced the Nook. What was a little surprising, if you combine the two Ebook formats, the paperback just edged them out. I am a fan of Ebooks, own a Kindle myself, and have been hearing all about their increased popularity, but I was still a little surprised that the markets were almost equal in January. In the next few posts, I will pass along my experiences with preparing and selling each version, and let you know how I would do it differently next time. Someone posted on Facebook a screen shot of his Kindle. 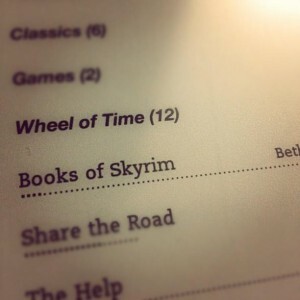 He was excited about getting the Wheel of Time series in Ebook form. The nerdy proud moment is seeing my book on the same screen. The world of book publishing is changing by the minute. The introduction of both the Ebook and the ability to Print on Demand have opened up access to the market. No longer are book publishers the gate keepers to decide what books do and don’t make it into print. And of course most authors need an agent to even get in the publisher’s door. This adds another level of gate-keeping, for you need to convince an agent that your work is worth their time, and it adds another person who needs to be paid for their work. By some estimates, three out of every ten thousand unsolicited manuscripts ever get accepted for publishing. And the lag time is significant. Even if you are one of the lottery winners to make it through, your work won’t see the light of day for 18 to 24 months. Some say the current model is broken, but it is resisting change. Many of the major publishers continue to discourage Ebook sales by pricing them too high. Publishers make most of their money on hardback sales. They not only delay Ebook release as they do with paperbacks, but they often price the Ebooks higher than the paperback, even with the reduced production, shipping and return costs. 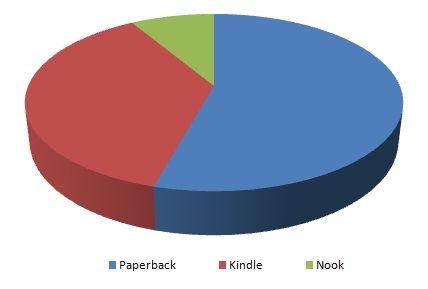 But trying to kill the Ebook appears to be a losing battle with the increased popularity of the Kindle, Nook and iPad. But I didn’t self-publish Share the Road because I wanted to thumb my nose at traditional publishers because of their broken system, or because they rejected me. I did not find an agent, and I knew that after the first draft was finished that I wanted to self-publish the book. There would be no monetary advance, book tours, and my book will likely never grace the shelf of a bookstore. So why self-publish? Share the Road is not a typical book. And I don’t mean that it breaks new ground that hasn’t been seen or understood by the fiction genre. What I mean is that I can’t point to the book and say that it is similar to the work of this author, or this type of book. I can’t say it is the next Harry Potter, Hunger Games, or Girl Who Plays With Fire. Chasing what is popular in the moment can be a pointless exercise with the built-in delay to publishing, but agents and publishers need to feel confident that there will be an established audience for your book. They don’t want to risk their time or money on a brilliantly written book that no one will buy. They want a sure thing, they want the next John Grisham. Movie houses are much the same, which is why we see so many films that are near carbon copies of past hits. There are no zombie, vampires or wizards in my book. Just a guy and his bike. Another reason I self-published was the ticking clock. Share the Road ended up being a pretty personal book. I feel like I understand things better for having written it, and I think that others may find their own meaning in the story. Also, a portion of the book was written to honor a friend who had passed away. I think that those that knew him and know me will appreciate the story. And quite frankly, no one knows how long they have. I didn’t want the book sitting on my hard drive never to be read. Do I think the book would have made it past the traditional gate-keeper? We may never know. I am proud of the book, and I think it could find an audience. Otherwise I would have just printed up copies for my Mom and not released it on the world. It is possible that it could get picked up by a traditional publisher at a later date if it does well, but that might be another three in ten-thousand type of shot. I may try to find an agent and submit my next book to traditional publishers. 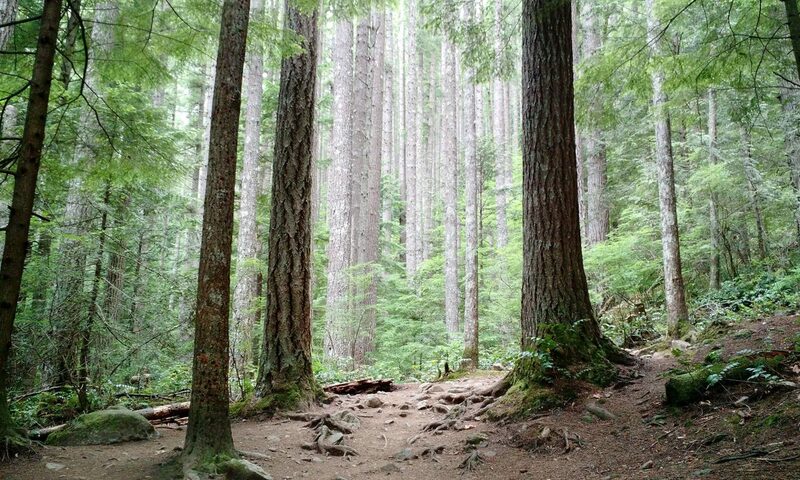 I have not yet tried the typical route, so I am not soured by it. The self-publishing adventure has been a great learning experience, and I am glad I chose to do it for Share the Road. I can’t remember who said it, or even the exact wording, but the point was something like, “A book isn’t a book until someone else reads it.” Or a story isn’t a story until…you get the picture. I have had this story as a work in progress for a year now. No one read the first two drafts, so even though it was down on paper, it was still sort of living just in my head. I eventually showed the story to eight beta readers looking for feedback, etc. One of them asked me if I was nervous/freaked out about putting the story out there to be judged. At the time, I really wasn’t. This wasn’t from any sort of confidence in my writing ability. It was still a work in progress, and at that point I was looking for ways to improve it. I was actively seeking critiques (and maybe a little praise). They came back with lists of typos, corrections, and varying opinions on the strengths and weaknesses, and that was exactly what I was looking for. And quite frankly, I wanted someone besides me to read it. Like the above quote says, it wasn’t a real story yet. Other people need to read your words, interpret them with their own unique experiences, and maybe come away with something you never imagined. Each of the beta readers seemed to key in on something different, and it made me see the story in a whole new light. Now the story is out there as a finished work. More eyes are on it, which is outstanding, but it is a little different this time. Not only have they paid money to read my words, but unlike the first eight, this audience is (rightly) expecting a polished work. So, I am a little more anxious this go round. That is to be expected, of course. Whenever you produce something for public consumption, you are putting yourself out there, taking a little risk. You are bound to be a little anxious, and nervous about feedback. Everything I have read says to not take reviews or comments (good or bad) too seriously. Especially with the anonymity of the internet, things could get ugly. I won’t pretend I am not going to read the reviews, because I will. I have an ego just like everyone else, so it will rise with the good ones, and take some hits with the bad ones. But I am excited and curious because this is what I asked for by putting it out there – more eyes, more interpretations, and for the story to become a story. ‎To write something, you have to risk making a fool of yourself. Share the Road is now available as an Ebook for the Barnes & Noble Nook. Just like the Kindle version, it is $2.99 and can be purchased through the link in the left sidebar. Or you can just search for “Share the Road” on the Barnes & Noble site. Or I could just point you there. I will have a post up soon on my first impressions with Ebook publishing. Sean’s self-published debut novel is now available for purchase. You can pick up a copy in paperback for $7.19, and the ebook version is $2.99 for the Kindle. You can find a description and preview of the novel on the Share the Road page. My goal was to get my first novel published by the end of the year, and I got it in just under the wire. I finished off the latest edit, and I sent off a copy at the end of November to one of my beta readers to check for typos and grammar errors. While I was waiting to hear back, I read it again. And edited it again. This really could go on forever. As I mentioned in my last post, the book still needed a new cover before I put it up for sale. I had some initial pictures and better ideas were developing, but then rain and a trip to Seattle for the holidays stalled progress on the new cover. While I was in Seattle, I got my typo report back, fixed them, worked on the website and other background stuff, but I couldn’t do anything about the cover until I got back in town. I returned the night of the 26th and headed out on the 27th for another photo shoot. After lots of dashing back and forth with the self-timer, I had thirty more photos. I couldn’t really see how the photos turned out with the sunlight bouncing off of the camera screen, so I went home hoping I had something good. I ended up using the last photo I took, so I am glad I kept trying. I updated the cover with the new photo, and was ready to submit it for file approval. And I was still messing with the text. I had to get this thing out of my hands. I uploaded it to CreateSpace and waited for them to make sure there weren’t any formatting problems. I received their approval on the 29th and immediately ordered a proof. Now I had to wait for the hard copy to show up so I could make sure everything looked okay in print. The anticipated ship date was sometime around January 6th, so I wasn’t going to make my year-end deadline. But I was so close I was willing to call it a victory. Then, somehow, during the post-Christmas chaos of shopping and shipping, CreateSpace and the Post Office had the proof in my hands on the afternoon of December 31st. I filled out all the last minute synopsis, author bio and pricing information and hit “Approve” at around 5:00pm. I was published. More or less. The book could have been purchased on the CreateSpace site that day, but it didn’t show up on Amazon until January 1st. The listing still isn’t completely ready as the web machines haven’t attached the synopsis and preview, but it is available for sale!